The Forthcoming Events at the Cornish Seal Sanctuary for 2019 are all about having fun, making new friends and sharing a story or two. The Seal Sanctuary wants you to leave with amazing memories of your time, so they have created an exciting events calendar which is sure to get your seal of approval. Meet the Staff at Coverack beach on the following dates and times:- 20th April (12noon-1pm); 21st May (2pm-3pm); 8th June (2pm-3pm); 2nd July (11am-12 noon); 4th August (2pm-3pm); 21st September (3pm-4pm); 10th October (10.30am-11.30am). Click here for more information. Say hello to the seals and take in the view of the Helford estuary during the 3K muddy fun run at the Cornish Seal Sanctuary on Sunday 24th March 2019! Registration 8.30am - Run starts at 9.30am. Click here to read more. Join the Cornish Seal Sanctuary at Coverack beach between 3pm and 4pm and be part of something even bigger this Valentine´s Day as we show our love by cleaning our local beaches! All Welcome! #loveyourbeach Click here to find out more. The grey seals mating season begins around September time, this also coincides with rougher seas and storms approaching. What this means is that during this time the staff get a lot of seal pup call outs. The British Divers Marine Life Rescue (BDMLR) and the Cornish Seal Sanctuary rescues between 60 and 70 pups each year. As the leading Seal Rescue Centre in Europe and the only one in Cornwall, the sanctuary then becomes home to these pups while they are rehabilitated until they are ready for release. The hospital and pools will be full and it´s the perfect time to for a visit. Seal Hospital "Behind the Scenes Experience"
Explore behind the scenes at the heart of marine rescue in Cornwall´s only working Seal Hospital. See how the Cornish Seal Sanctuary carry out life-saving work with the animals and nurture new arrivals. Click here for more information. 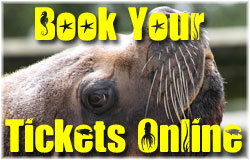 More details about these forthcoming events, please contact the Cornish Seal Sanctuary on 01326 221361. Please note: Some of the above Forthcoming Events at the Cornish Seal Sanctuary could be subject to change. Don´t forget to purchase your entrance tickets on-line in advance and Save Money. When you click here or on the button right, it will take you through to the official Sanctuary´s SEA LIFE Trust (sealsanctuary.sealifetrust.org) website for the Best Price Guarantee. The staff at the Cornish Seal Sanctuary do a brilliant job and without your help & support, they couldn´t continue.